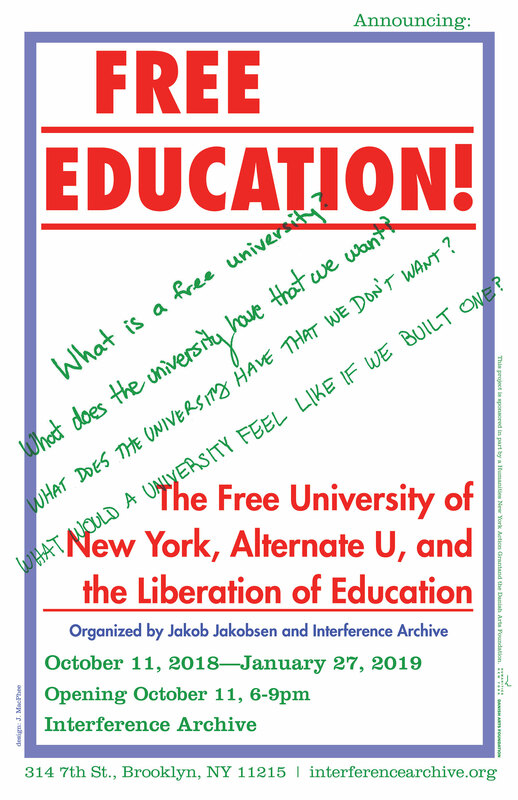 Rooted in an examination of the history of the Free University of New York (FUNY), a 1960s experiment in radical education, this exhibition and event series reflects on the questions: What is a university? What does the university have that we want? What does the university have that we don’t want? How would a university look if we could build one from scratch? By combining original archival documents from FUNY as well as from related projects, including Alternate U and the Freedom Schools movement, this exhibition explores what it means to have a space for community at the intersection of art and politics, and how we generate history together through our work in these community spaces. In our current moment, when the price of education amounts to crippling student debt and underemployment is a reality for even the most qualified post-secondary graduates, Free Education! aims to generate conversation within our community–across generations and socio-economic realities –about what it looks like to reimagine possibilities for education. Through our exhibition as well as related events involving past participants in FUNY-related projects we will look at the various leftist threads across the United States that led to FUNY, from a 1964 trip to Cuba organized by Progressive Labor, 1960s student movements, the Lower East Side poetry scene, the Free Speech movement in Berkeley, and the peace movement; and we trace these through to projects that evolved from FUNY including feminist militancy, Newsreel filmmakers, Tolstoy College, poetry publications, radical psychiatry, Feminist theatre, and more. Our series of related free public programs will come into dialog with organizers of current, similar projects, including Free University NYC, the Strike Debt project, and organizers at Cooper Union. This exhibition includes an audio component featuring dialogue based on the transcripts of ten interviews with former participants of the Free University of New York and Alternate U recorded in 2017 and 2018. Interviewees include Susan Sherman, David McReynolds, Stanley Aronowitz, AB Spellman, Keith Brooks, Norman Fruchter, Robert Machover, Miriam Frank, Sue Simensky and Joe Berke. We are grateful to them for their generosity in sharing of their life stories. Additional material in the exhibition is made available through Susan Sherman, Keith Brooks, Perry Brass, Tamiment Library and Robert F. Wagner Labor Archives, and PETT archive. This exhibit curators hope that this exhibition will recognize and honor the legacy of David McReynolds, war resister and Free University lecturer, 1930 – 2018. For related programming, visit HERE.